You can convert a String object to Boolean object or boolean primitive by using the Boolean.valueOf() and Boolean.parseBoolean() method. 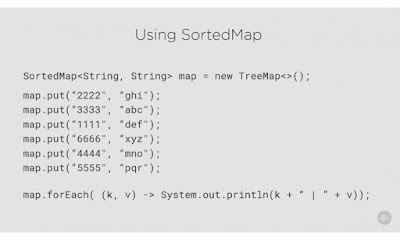 The steps are similar rot converting to String to other data types e.g. String to Integer and String to Long. You can use valueOf() method to convert String to Boolean object and parseBoolean() method to convert given String to boolean primitive value. Internally, valueOf() also uses parseBoolean() for parsing String but on top of that it also provides caching e.g. it can return Boolean.TRUE and Boolean.FALSE cached value for "true" and "false" string. In fact, the Boolean.TRUE is returned only when String is equal to true ignoring case e.g. "True", "true", "TRUE" will evaluate into boolean true, hence Boolean.TRUE will be returned. For string like "Yes", Boolean.FALSE will be returned. We'll discuss the rules of String to boolean conversion in next section. If you want to know more about how to convert one data type to other in Java, The Complete Java Masterclass is a good resource to learn it in depth. The parseBoolean() method is similar to parseInt() method and it returns a primitive boolean value after parsing given String. It returns a boolean value, true or false based upon the rules given above. It compares String by ignoring case and only return true if String matches true after ignoring cases. You should use this method if you need a primitive boolean value. 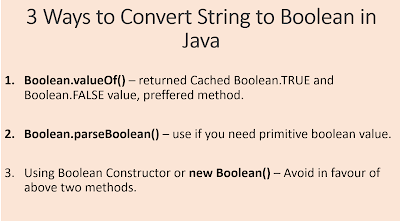 This method should be used to convert a String object to a Boolean object in Java. It leverages the parsing logic of parseooleBan() method but it also uses the Flyweight design pattern to cache frequently used value and returns them. Since boolean can either be true or false, it just uses two Boolean instances, Boolean.TRUE and Boolean.FALSE, for all String to Boolean conversion, which drastically reduces the number of objects and causes less overhead for Garbage collector. You should use this method if you need a Boolean object from String rather than boolean primitive value. If you want to know more about primitive data types in Java then Java Fundamentals: The Java Language a good place to start with. Here is your complete Java program, which you can copy and paste in your Eclipse IDE and run. This program accepts a user input as String and tries to convert it to a boolean. If successful, it prints that value into the console, otherwise, it throws an error. * A simple Java Program to convert String to Boolean or boolean data type. System.out.println("converted boolean value from String using valueOf: "
.println("converted boolean value from String using parseBoolean: "
.println("converted boolean value from String using constructor: "
5.1 Even though you can also use the constructor of java.lang.Boolean class to convert String to a Boolean object, it's not encouraged by Effective Java of Joshua Bloch, which advice prefer static factory methods like valueOf() to take advantage of caching they offer. 5.2. The parsing rules i.e. how the string is actually converted into a boolean value is written in parseBoolean() method. 5.3 Both valueOf() and parseBoolean() method belongs to java.lang.Boolean class. 5.4. The valueOf() method return either the Boolean.TRUE or Boolean.FALSE object, which is shared by all boolean values converted. That's all about how to convert String to Boolean or boolean in Java. As I said, you can use either Boolean.valueOf(), a static factory method or the parseBoolean() method for this conversion. The rule of thumb is to prefer valueOf() if you need Boolean object and parseBoolean() if you need a boolean primitive value.